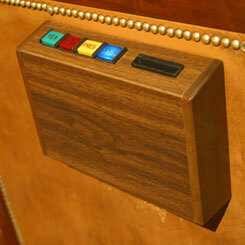 About this object Introduced in 1973, the electronic voting machine revolutionized the congressional voting process. On this date, President Richard M. Nixon signed the Legislative Reorganization Act of 1970 into law. Proposed by the Joint Committee on the Organization of Congress, the legislation overhauled congressional internal procedures and administration for the first time in a generation. The House passed the final version of the bill on October 8, 1970. The reforms made House and Senate processes more transparent by making all committee hearings (excluding national security meetings and Appropriations) public, as well as by permitting televised broadcasts of many of these committee hearings. The most extraordinary change to the House of Representatives was the addition of electronic voting to the House Chamber. The state of the art million-dollar system eventually went into operation on January 23, 1973. The first vote was a 15 minute roll call vote of Members, which prior to the electronic system took on average 30 to 45 minutes.